When you deploy the full Shelly product suite across your enterprise, you will begin to amass a large and highly valuable gold mine of data about your operations. This collected data is analyzed and shared throughout your Shelly software, or perhaps other third party software, to perform the many tasks that drive your business every day, such as, warehouse management, work order processing or shipment preparation, to name a few. The immediate benefit, of course, is that your newly embedded Shelly product suite will begin to find and identify work process improvements throughout every level of your organization. However, beyond that initial return on investment with Shelly products is an entirely new landscape of revenue-generating opportunities that can expand your profitability…without any additional cost to you. Instead of ROI, consider it ROEI…Revenue on Existing Investment. 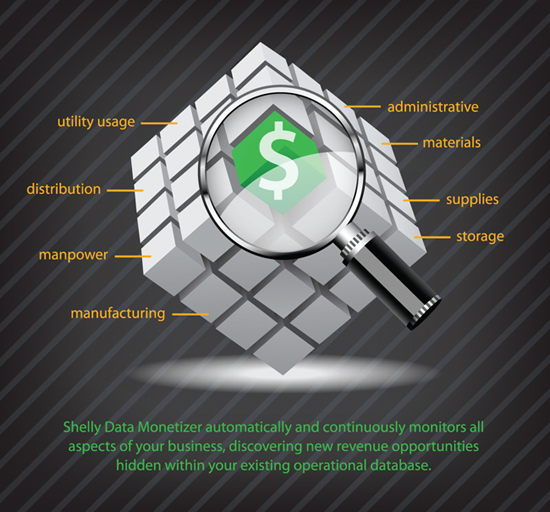 Our Shelly Data Monetizer takes the very same collected data that makes your business run more efficiently and reconfigures it into tables, zones and fields from which you can extract new patterns and information. Essentially, mining new reports from your company’s existing database in a way that will make this new information highly targeted, and highly desirable, to many potentially new customers. To put it simply, the Shelly Data Monetizer automatically and continuously mines for new streams of revenue using the same robust operational information you’ve already gathered through your initial Shelly software investment. Hence, monetizing data that results in pure profit for you. While your customers come first, your suppliers, subcontractors, etc., can harness your existing process efficiency reports to improve their own products and services. Think about all the touch points in your Shelly streamlined operational workflows; the hardware, the software, the machinery, the components, manpower usage, and much more, that work together to produce your goods and support your services. Now, look at all of those touch points as data points that can be harvested, packaged and monetized. We’ve already done the work for you. Your onboard Shelly software suite is already designed to detect, assemble, appraise and validate this newly mined data for you. Guiding you toward new revenue streams via your existing collected data is what Date Monetizer is all about. In fact, you don’t even need to know what you’re looking for… Data Monetizer will suggest new revenue possibilities from the existing data. Even better, when you make a modification or enhancement to one of your existing workflows, Shelly Data Monetizer automatically adjusts to mine those modifications for new revenue streams. This means you’ll never miss an opportunity to discover new profit opportunities from your existing information database. Let us show you how Shelly Data Monetizer can optimize your initial Shelly Software investment by providing new revenue opportunities on top of the superior process improvements we already deliver.